Time for a food post! Truth be told, I haven't been doing much cooking lately... I've been a bit busier than normal with the handful of events I've attended recently, as well as with my trip to New York. 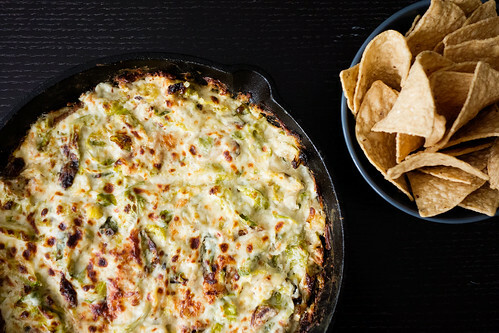 So, I figured now is as good a time as any to share this delicious dip I made a little while back. It was to die for and I'll probably make it again tomorrow because the memory of it (plus Andrew's photos) is already making my mouth water. I originally found the recipe for this dip online which, of course, I can't locate now... Luckily, I revamped it as I went along and my scribblings have been hanging on our fridge ever since! Before you even introduce any of the creamy/cheesy ingredients into the mix, the Brussels sprouts are totally worth eating. Often times we'll eat them just like that, with shallots and garlic alone, as a side. 1. Over medium heat, cook shallots and garlic in a cast iron skillet for 1-2 minutes. 2. Add Brussels sprouts, sprinkle with salt and pepper to taste, and cook till bright green - up to 7 minutes if you like your greens a lightly charred (like me). 3. Combine sour cream and cheeses in a mixing bowl, add additional salt and pepper to taste, and stir. 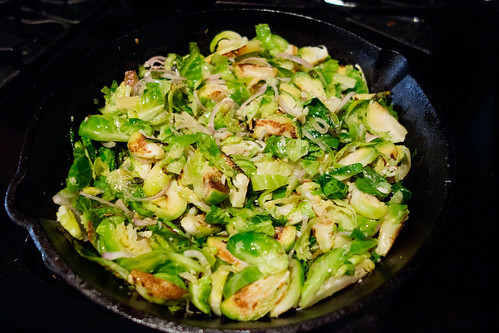 Add Brussels sprouts and shallots to the bowl and mix. 4. 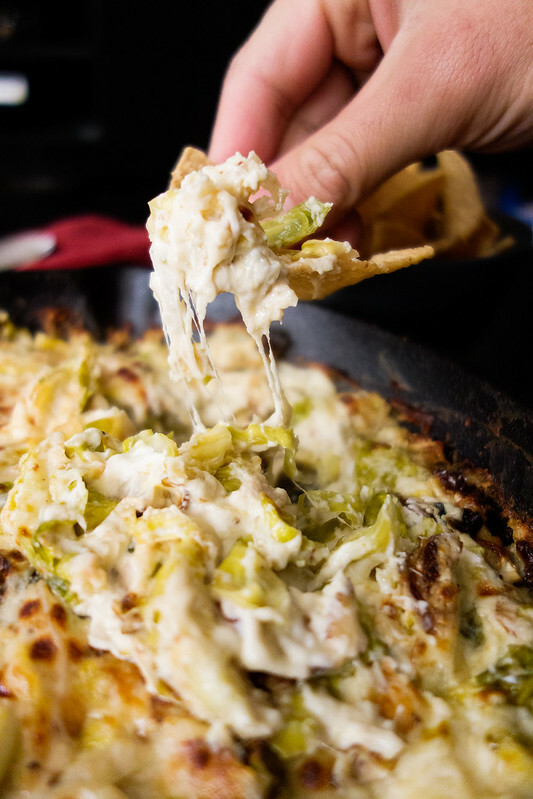 Scoop dip back into the skillet and bake at 375° for 15 minutes or until browned on top - you can also stick it in your broiler for an additional minute or two. It was so deliciously creamy and you know I'm all about creamy-cheesy goodness. I promise we eat more veggies than just Brussels sprouts. We just love them so much! that looks so cheesy and delish!! i saw this last night and cannot stop thinking about it. i wish brussel sprouts were still in season! You're such a good person! If I'm desperate enough, I'll totally ignore what is/isn't in season and just go with my intense cravings. I bet this would be delicious with artichokes and/or spinach, too!